Doors and doorways offer a tantalising glimpse into other worlds. I love nothing more when travelling than to peek into open doorways. I’ve often seen very elaborate doors, or photographs of doors painted in pretty colours. But when I began looking through my image files to meet this week’s travel theme from Ailsa at Where’s My Backpack?, I realised that some of the doors that I remembered most were those I’d rather not have looked beyond. The doors I’m featuring here are near Phnom Penh, in Cambodia. They were opened in early 1979 to reveal the atrocities of the Pol Pot regime. This former high school was taken over in 1976 and renamed S-21, a place were prisoners were interrogated, tortured and executed. Of the 14,000 people who passed through these prison doors, only seven survived. One of those survivors, Mr Chum Mey, was our guide as we ventured in to learn more about the genocide carried out by the Khmer Rouge. 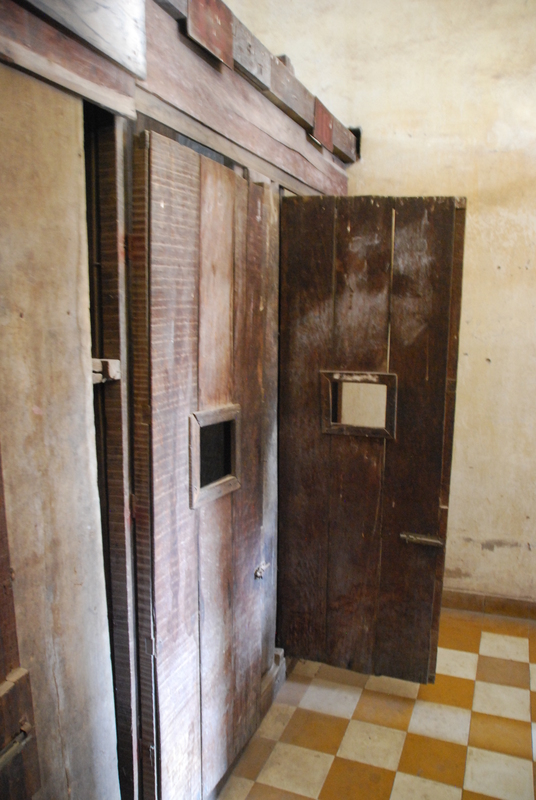 The Tuol Sleng Museum of Genocide is harrowing. Every prisoner was photographed and around 6000 of those faces now stare down from the walls of the museum. The building still looks like a school. In one building, classrooms have been left to appear as they were in 1977. The interrogation rooms are furnished with an old iron bed, with shackles at each end. The only other items in the room are a school desk and chair. 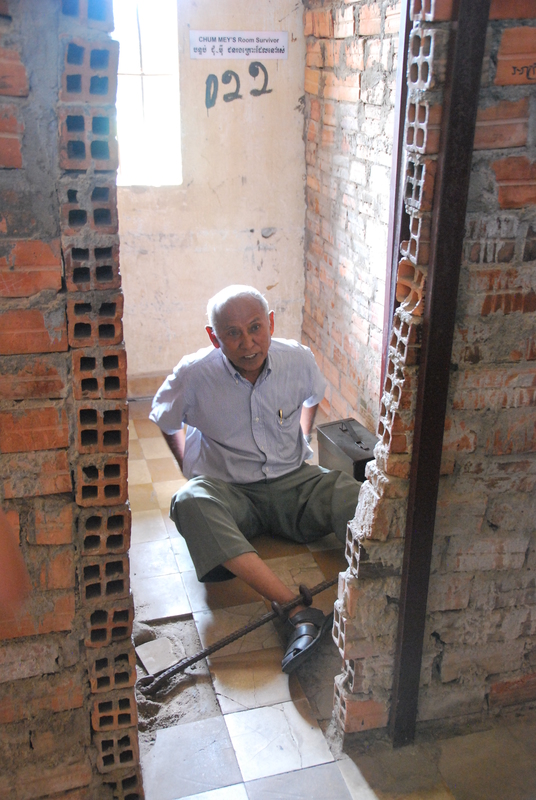 Mr Chum Mey tells his story almost daily, leading visitors through the cells. He takes them to his cell, a tiny brick box and tells of living conditions that were “as bad as hell”. He not only opened the doors for us, he opened our minds to knowledge of atrocities that no people should have to endure. I would too, Goddess. Loved it, and had way too little time there! I’ve been there…it was not easy. All of those photos are pretty confronting. I find it so hard to be in places like this because–and this may sound weird–they have this awful energy. Was it hard to be there? Yes, it was a very confronting place. I understand completely what you mean about the energy. I just saw a documentary that featured this building. So tragic what these doors once contained. Absolutely tragic – but important that we see them and learn about them. The resilience of the Cambodian people is extraordinary. I only had a few days there, but would love to go back. Chilling example of the theme indeed. This was chilling. I can’t believe Mr. Mey can stand to go back there. This is a place I’d definitely seek out if I were in Cambodia, but I’m not sure I could stand it. This may be a country I never go to.